In this paper, we discuss the problem of maintenance of a CBR system for retrieval of rotationally symmetric shapes. The special feature of this system is that similarity is derived primarily from graph matching algorithms. The special problem of such a system is that it does not operate on search indices that may be derived from single cases and then used for visualisation and principle component analyses. Rather, the system is built on a similarity metric defined directly over pairs of cases. The problems of efficiency, consistency, redundancy, completeness and correctness are discussed for such a system. Performance measures for the CBR system are given, and the results for trials of the system are presented. 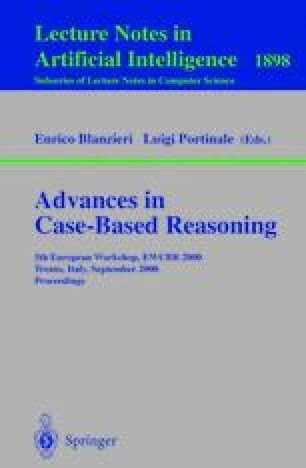 The competence of the current case-base is discussed, with reference to a representation of cases as points in an n-dimensional feature space, and a Gramian visualisation. A refinement of the case base is performed as a result of the competence analysis and the performance of the case-base before and after refinement is compared.